In 2007, Congress declared in the Energy Independence Act (EISA) that modernizing the grid is national policy. EISA requires the National Institute of Standards and Technology (NIST) to develop a consensus on the standards and protocols necessary to ensure Smart Grid functionality and interoperability. EISA requires FERC, once sufficient consensus has been achieved through a process managed by the National Institute of Standards and Technology (NIST), to adopt standards and protocols necessary to ensure Smart Grid functionality and interoperability in the interstate transmission of electric power and in regional and wholesale markets. This effort is focused on an accelerated timetable. The key balancing point is to develop standards that enable interoperability without being so prescriptive that prevents innovation. As specified in the American Recovery and Reinvestment Act (ARRA), NIST is receiving $10 million through the Department of Energy (DOE) to carry out responsibilities assigned under EISA. In addition, NIST is allocating $5 million in ARRA funding for this purpose. The funding supports collaborative efforts to develop a comprehensive framework for a nationwide, interoperable Smart Grid for the U.S. electric power system. The task is akin to developing standards for the next-generation telecommunications network. This effort has spanned many years, continues to evolve, and involves dozens of standards development organizations. Also, like the telecom network, the Smart Grid is almost entirely owned and operated by industry. Therefore, Smart Grid interoperability and cyber-security standards must reflect industry consensus, with active participation, and where required, leadership and coordination by government. Throughout 2009 and 2010, NIST’s Smart Grid program has been vigorously implementing this three-phase plan to develop a roadmap, engage the community of stakeholders, and establish testing programs. Key milestones include. IEC 62351:Addressing the cyber security of the communication protocols defined by the preceding IEC standards. On July 19, 2011, FERC found that there is insufficient consensus at this time to adopt, under section 1305(d) of EISA, the five families of IEC standards that NIST identified in its October 6, 2010 letter to the Commission. They said "Commenters are nearly unanimous that we should not adopt these standards at this time, citing concerns with cyber security deficiencies and potential unintended consequences from premature adoption of individual standards. The Commission agrees with commenters’ concerns, [you can find industry comments here] observant that certain aspects of the current NIST process were not in place during development of the NIST Framework document and identification of the IEC standards. For this reason, the Commission will not institute a rulemaking proceeding at this time with respect to these standards and terminates this docket. In this order, the Commission encourages stakeholders to actively participate in the NIST interoperability framework process to work on the development of interoperability standards and to refer to that process for guidance on smart grid standards." Having standrds is very important, but mandating standards by a regulator is not always necessary. While EISA 2007 directed FERC to develop standards, the legislation did not confer the authority to enforce them. Even if it had, FERC has no jurisdiction over intrastate distribution grids where much of the smart grid action takes place. NIST has and continues to promulgate standards through the NIST process. This process calls for relevant standards setting organizations (e.g., OASIS, SAE, ASHRAE, ANSI and so forth) to develop the actual standard. The element that's different is the existence of the SGIP as a vetting and coordinating body. By voting to "adopt" standards, essentially NIST is granting the imprimatur of "version 1.0". By referring this action to FERC, NIST publicized that fact. FERC's action acknowledges that this is v1.0 and reconfirms Congress' intent that these be voluntary. On July 26, 2011, The Smart Grid Interoperability Panel (SGIP) announced it has made the first six entries into its new Catalog of Standards, a technical document now available as a guide for all involved with Smart Grid-related technology. The six standards, all of which had been approved previously by the SGIP's Governing Board, received approval by greater than 90 percent of the broader SGIP membership in voting earlier in July. While the SGIP does not develop or write these standards directly, a vote of approval signifies that its member organizations have agreed on the inclusion of a group of standards in the catalog. Actor - A devices, computer system, software program, or the individual or organization that participates in the Smart Grid. Actors have the capability to make decisions and to exchange information with other actors. Organizations may have actors in more than one domain. Alliances - A group of entities and individuals that recognize the value of a particular technology, and form a formal interest group to promote the codification of design and marketing of that technology. Since any number of interested parties can form an alliance, the rules under which they operate vary widely. Since an alliance is not required to have a balanced membership, or in some cases to follow certain antitrust regulations, the work products must be submitted to a standards development organization (SDO) in order to become true de jure standards. Often, the alliance may actually promote specifications as “standards,” before they are officially codified in a manner similar to a formal SDO. Also, one of the primary goals of most alliance efforts is demonstrable product interoperability within the framework of a defined certification program. Architecture - Philosoply and structural patterns encompassing technical and business designs, demonstrations, implementations, and standards that, together, convey a common understanding of the Smart Grid. The architecture embodies high-level principles and requirements that designs of Smart Grid Applications must satisfy. Cyber Security - The protection required to ensure confidentiality, integrity and availability of the electronic information communication systems. De jure standards are those that have been codified by a standards organization. SDOs author de jure standards; those that are codified in a manner similar to laws. Given the careful attention to balloting balance, open rules, and open participation, standards may be adopted in place of laws in certain jurisdictions. Domain - Each of the seven Smart Grid domains is a high-level grouping of organizations, buildings, individuals, systems, devices or other actors with similar objectives and relying on similar types of applications. Communications among actors in the same domain may have similar characteristics and requirements. The transmission and distribution domains may have much overlapping functionality and often share networks. Harmonization - The process of achieving technical equivalency and enabling interchangeability between different standards with overlapping functionality. Harmonization requires an architecture that documents key points of interoperability and associated interfaces. Interoperability - The capability of two or more networks, systems, devices, applications, or components to exchange and readily use information - securely, effectively, and with little or no inconvenience to the user. The Smart Grid will be a system of interoperable systems. That is, different systems will be able to exchange meaningful, actionable information. The systems will share a common meaning of the exchanged information, and this information will elicit agreed upon types of response. The reliabilty, fidelity, and security of information exchanges between and among Smart Grid systems much acheive requisite performation levels. The Enterprise Bus, that connects control center applications to markets, generators and with each other. Premises Networks that include customer networks as well as utility networks within the customer's domain. NIST Smart Grid Interoperability Standards Framework. The NIST document will describe a high level architecture, identify an initial set of key standards, and provide a roadmap for developing new or revised standards needed to realize the Smart Grid. Release 1.0 of the NIST Smart Grid Interoperability Standards Framework is planned to be available in September. Reference Model - A set of views (diagrams) and descriptions that are the basis for discussing the characteristics, uses, behavior, interfaces, requirements and standards of the Smart Grid. This does not represent the final architecture of the Smart Grid, rather it is a tool for describing, discussing, and developing that architecture. Requirement - A condition or capabilty needed by a user to solve a problem or achieve an objective. SDO - Standards Development Organizations operate under similar rules as alliances worldwide. In general terms, the members of the committees doing the actual development work are limited by antitrust rules or laws from engaging in anticompetitive behavior such as market division, pricing discussions, and the like. Also, intellectual property is treated as a potential source for standards language, and requires disclosure by the holder. Unlike an alliance or users group, an SDO maintains strict control of the candidate voter pool for balloting to ensure a measure of fairness and balance. To move beyond standards that are regional in scope, there are pacts in place to allow co publication of standards between the IEC and IEEE, ANSI and IEEE, and others. This is the first step toward true harmonization, whereby a standard is in place for a broader market. Standards - Specifications that establish the fitness of a product for a particular use or that define the function and performance of a device or system. Standards are key facilitators of compatibility and interoperability. They define specification for languages, communication protocols, data formats, linkages within and across systems, interfaces between software applications and between hardware devices. Standards must be robust so that they can be extended to accomodate future applications and technologies. User Group - A differentiator between users groups, alliances, and formal standardization organizations is that user group rules often permit more free discussion between those actually using standards and specifications than those of the developing organizations. NIST PHASE 1 Identified an initial set of existing consensus standards, included use cases to identify standards/specifications and areas of application, and developed a roadmap to fill gaps. These were “low hanging fruit”, well established in their domain with establish SDO’s and User Groups. This promulgation of open standards will likely encourage firms to invest more capital in smart and efficient end-use devices and supporting infrastructure components because the barrier of closed, proprietary systems that lock out new entrants will have been removed. The result will be a higher degree of technological innovation in energy efficient devices and supporting control components, thus yielding energy savings and corresponding carbon reductions. BACnet - ANSI ASHRAE 135-2008/ISO 16484-5 Building Automation - BACnet defines an information model and messages for building system communications at a customer’s site. BACnet incorporates a range of networking technologies to provide scalability from very small systems to multi-building operations that span wide geographic areas using IP protocols. It is an open, mature standard with conformance testing developed and maintained by an SDO. BACnet is adopted internationally as EN ISO 16484-5 and used in more than 30 countries. This standard serves as a customer side communication protocol at the facility interface and is relevant to the Price, DR/DER, and Energy Usage PAPs. ANSI C12.19/MC1219 - Revenue metering information model. It is an extremely flexible revenue metering model that allows such a wide range of options that requests for actionable information from a meter, such as usage in kilowatt hours, requires complex programming to secure this information. ANSI/CEA 709 and CEA 852.1 LON Protocol Suite - Widely used, mature standards, supported by the LonMark International users group. Proposed for international adoption as part of ISO/IEC 14908, Parts 1, 2, 3, and 4. These standards serve on the customer side of the facility interface and are relevant to the Price, DR/DER, and Energy Usage PAPs. ANSI/CEA 709.1-B-2002 Control Network Protocol Specification - This is a general purpose networking protocol in use for various applications including electric meters, street lighting, home automation, and building automation. CEA-852:1-2009 Enhanced Tunneling Device Area Network Protocols Over Internet Protocol Channels - This protocol provides a way to tunnel local operating network messages through an IP network usuign the User Datagram Protocol (UDP) thus providing a way to create larger networks. DNP3 - Substation and feeder device automation - (Distributed Network Protocol) – A set of communications protocols used between components in process automation systems. Its main use is in utilities such as electric and water companies. It was developed to facilitate communications between various types of data acquisition and control equipment. It plays a crucial role in SCADA systems, where it is used by SCADA Master Stations (aka Control Centers), Remote Terminal Units (RTUs), and Intelligent Electronic Devices (IEDs). It is primarily used for communications between a master station and RTUs or IEDs. ICCP, the Inter-Control Centre Protocol, is used for inter-master station communications. While IEC 60870-5 was still under development and had not been standardized, there was a need to create a standard that would allow interoperability between various vendors' SCADA components for the electrical grid. IEC 60870-6 / TASE.2 - Inter-control center communications. - Defines the messages sent between control centers of different utilities. IEC 61850 - Substation automation and protection. Defines communications within transmission and distribution. substations for automation and protection. It is being extended to cover communications beyond the substation to integration of distributed resources and between substations. Several PAP's are dedicated to further develop information models for electric transportation. IEC 61968 / 61970 - Application level energy management system interfaces.These families of standards define information exchanged among control center systems using common information models. They define application-level energy management system interfaces and messaging for distribution grid management in the utility space. These open standards that are starting to become more widely implemented, developed and maintained by an SDO with support from a users group. They are part of PAPs relating to integration with IEC 61850 and Multispeak. IEEE C37.118 - Defines phasor measurement unit (PMU) performance specifications and communications. Open standards, widely implemented, developed and maintained by an SDO. Standard includes some requirements for communications and measurement and is currently being updated by IEEE Power System Relaying Committee (PSRC) Relaying Communications Subcommittee Working Group H11. Some items not covered in C37.118 include communication service modes, remote device configuration, dynamic measurement performance and security. The protocol will not map to very large systems that include more than a couple hundred PMU devices. The gaps between C37.118 and IEC61850 are being addressed in PAP13 Time Synchronization. IEEE 1547 Suite - This family of standards defines physical and electrical interconnections between utility and distributed generation (DG) and has significant implementation for the parts covering physical/electrical connections. The parts of this suite of standards that describe messages are not as widely deployed as the parts that specify the physical interconnections. Many utilities and regulators require their use in systems. Revising and extending the IEEE 1547 family is a focus of the PAP07 covering energy storage interconnections. IEEE 1588 - Time Management and Clock Synchronization across the Smart Grid, equipment needing consistent time management. Open standard. Version 2 is not widely implemented for power applications, developed and maintained by an SDO. IETF RFC 768 (UDP) - Provides a procedure for application programs to send messages to other programs with a minimum of protocol mechanism. IETF RFC 2460 (IPv6) - Specifies version 6 of the Internet Protocol (IPv6), also sometimes referred to as IP Next Generation or IPng. Open Automated Demand Response (Open ADR) - Defines messages exchanged between utilities and commercial/industrial customers for price-responsive and direct load control. Developed by Lawrence Berkeley National Laboratory, used primarily in California. It is part of PAP09 to develop standard demand response signals. OPC-UA Industrial - A secure, high-speed, platform-independent data pipe from one system to another based on a tight publish/subscribe mechanism to provide a plug-n-play interface to another system with significant internak high speed data. Used in a variety of operational domain applications. ZigBee/HomePlug Smart Energy Profile - Home Area Network (HAN) Device Communications and Information Model. A profile under development, but anticipated to be technology-independent and useful for many Smart Grid applications. OpenHAN - Home Area Network device communication, measurement, and control. It is a a specification developed by a users group, UCAIug, that contains a “checklist” of requirements that enables utilities to compare the many available HANs. AEIC Guidelines v2.0 - Utility generated framework and testing criteria for vendors and utilities who desire to implement standards based AMI (StandardAMI) as the choice for Advanced Metering Infrastructure (AMI) solutions. Security Profile for Advanced Metering Infrastructure, v 1.0, Advanced Security Acceleration Project – Smart Grid, December 10, 2009 - This document provides guidance and security controls to organizations developing or implementing AMI solutions. This includes the meter data management system (MDMS) up to and including the HAN interface of the smart meter. The Advanced Metering Infrastructure Security (AMI-SEC) Task Force was established under the Utility Communications Architecture International Users Group (UCAIug) to develop consistent security guidelines for AMI. Department of Homeland Security, National Cyber Security Division. 2009, September. Catalog of Control Systems Security: Recommendations for Standards Developers - The catalog presents a compilation of practices that various industry bodies have recommended to increase the security of control systems from both physical and cyber attacks. This is a source document for the DRAFT NIST Interagency Report NISTIR 7628 Smart Grid Cyber Security Strategy and Requirements. DHS Cyber Security Procurement Language for Control Systems - The National Cyber Security Division of the Department of Homeland Security (DHS) developed this document to provide guidance to procuring cyber security technologies for control systems products and services - it is not intended as policy or standard. Because it speaks to control systems, its methodology can be used with those aspects of Smart Grid systems. IEC 62351 Parts 1-8 - Information security for power system control operations. This family of standards defines information security for power system control operations.Open standard, developed and maintained by an SDO, but not widely used yet. IEEE 1686-2007 - A standard that defines the functions and features to be provided in substation intelligent electronic devices (IEDs) to accommodate critical infrastructure protection programs. The standard covers IED security capabilities including the access, operation, configuration, firmware revision, and data retrieval. Open standard, developed and maintained by an SDO, not widely implemented yet. NERC CIP 002 thru 009 - These standards cover physical and cyber security standards for the bulk power system. Mandatory for the bulk electric system. Currently being revised by NERC. NIST Special Publication (SP) 800-53, NIST SP 800-82 - These standards cover cyber security standards and guidelines for federal information systems, including those for the bulk power system. 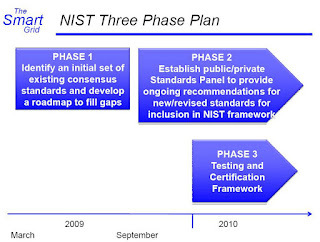 Open standards developed by NIST. SP800-53 defines security measured required for all U.S. government computers. SP800-82 is in draft form. It defines security specifically for industrial control systems, including the power grid. Sample Additional Standards, Specifications, Profiles, Requirements, Guidelines, and Reports for Further Review. ISO/IEC 15045 - A Residential gateway model for Home Electronic System - Specification for a residential gateway (RG) that connects home network domains to network domains outside the house. ISO/IEC 15067-3 - Model of an energy management system for the Home Electronic System - A model for energy management that accomodates a range of load control strategies. ITS - Intelligent Transport System Standard NTCIP 1213 - Electric Lighting and Management Systems (ELMS) - Created by DOT's Federal Highway Administration. Addresses open protocol remote monitoring and control of street, roadway and highway based electrical assets including lighting, revenue grade metering, power quality, and safety equipment using remote communicating ground fault and arc fault interupters. CableLabs PacketCable Security Monitoring and Automatin (SMA) - A technical report describing a broad range of services that could be provided over television cable, including remote energy management. This report contains a security, monitoring, and automation architecture for home networks and should be re-evaluated by the SGIP. Interoperability that will open up every aspect of the generation, distribution, and use of energy to innovation. Cyber/Physical Attacks Outside Scope - NIST's August 2010 Cyber Security Guidelines 1.0 did not address an important element essential to securing smart grid systems that it had planned to include—addressing the risk of attacks that use both cyber and physical means. NIST also identified other key elements that surfaced during its development of the guidelines that need to be addressed in future guideline updates. NIST officials said that they intend to update the guidelines to address the missing elements, and have drafted a plan to do so. While a positive step, the plan and schedule are still in draft form. Until the missing elements are addressed, there is an increased risk that smart grid implementations will not be secure as otherwise possible. Limited FERC Enforcement Authority "While EISA gives FERC authority to adopt smart grid standards, it does not provide FERC with specific enforcement authority. This means that standards will remain voluntary unless regulators are able to use other authorities—such as the ability to oversee the rates electricity providers charge customers—to enforce them" According to FERC officials, FERC’s only authority to require utilities to follow standards or use standards-compliant devices would derive from its existing reliability and cost-recovery authorities under the Federal Power Act, which generally apply to transmission assets used in interstate commerce. Scope - Standards might be defined too narrowly. NIST Workshop on interoperability creating standards for price signals. Price is an important element, but there are other types of information that consumers want to respond to right now, like the be market for green power. If we create a standard today that only allows price signals, we may be cutting out markets down the road. Interoperabilty - Even though using protocol, not necessarily interoperable. Certification requirement. Interoperability is generally being discussed too broadly and should be considered in two basic ways, with a focus placed on prioritization and acceleration of the adoption of “inter-system” standards. Test Programs - Some SDOs do not write test cases or define overall test programs. Intellectual Property Rights - Transparency and predictability of licensing terms for patents that are necessary to implement standards. Implementing interoperability standards may require licenses to dozens or hundreds of patents per standard. Standards development organizations have intellectual property rights policies that specify that participants will license patents essential to implement standards on reasonable and non-discriminatory (“RAND”) terms. Unfortunately, there is no consensus on what licensing terms are reasonable. This leads to a situation in which businesses developing products that implement standards, have very little visibility into licensing costs and terms. Evolving Cyber Security Risks - Cyber security research tends to operate like age and use on a rigid structure: fissures (or failures) tend to appear without warning and go to unpredictable depths. A cipher suite may go for decades without any significant attack, then suddenly encounter an assault that immediately compromises its use - sometimes partially and sometimes fully. This characteristic fundamentally distinguishes cyber security requirements from business requirements. Therefore, any reference to cyber security standards must provide a means to accommodate change and transition. This is an area where we cannot be too prescriptive, and must allow standards to evolve with advancements in technology. The key balancing point is to develop standards that enable interoperability without being so prescriptive that prevents innovation. Standards adoption must consider the current state of deployment, development in progress and vendor product development lifecycles. The number of stakeholders, range of considerations and applicable standards are very large and complex which requires a formal governance structure at a national level involving both government and industry, with associated formal processes to prioritize and oversee the highest value tasks. The smart grid implementation has already started, and will be implemented as an “evolution” of successive projects over a decade or more. Standards adoption must consider the current state of deployment, development in progress and vendor product development lifecycles. Achieving interoperability can be supported by adhering to the principles outlined in DOE's GWAC Decision-makers Checklist. Policy makers should utilize the ‘GridWise Architecture Interoperability Checklist’ to evaluate utility proposals for projects involving rate recovery. Regulations should be developed that encourage utilities and product vendors to support standards-based technologies over proprietary solutions. Regulations should avoid mandating specific standards or technologies where possible in favor of specifying desired outcomes and important characteristics of the standards to be employed. The work to develop and coordinate Smart Grid standards is ongoing, primarily through the Standing Committees, Working Groups, Domain Expert Working Groups, and Priority Action Plan teams of the SGIP. As these groups develop their recommendations, they are reviewed and adopted by the SGIP, through its governance structure. Throughout the process, the emphasis is on transparency, consensus, and public participation. Publication of the framework for Testing and Certification. Through the NIST workshops, it was determined that many of the standards noted above require revision or enhancement to satisfactorily address Smart Grid requirements. In addition, gaps requiring new standards to be developed were identified. A total of 70 gaps and issues were identified. Of these, NIST selected several which resolution is most urgently needed, For each, an action plan has been developed, specific organzations tasked and aggressive milestones in 2009 or early 2010 established. Meter Upgradeability Standard (Completed) (PAP 00) To manage change in a dynamically growing Smart Grid, it is essential to be able to upgrade firmware, such as meters, in the field without replacing the equipment or “rolling a truck” to manually upgrade the meter firmware. Remote image download capability, common practice today in many embedded computing devices, will permit certain characteristics of the meter to be substantially altered on an as needed basis. The National Electrical Manufacturers Association (NEMA) accepted the challenge to lead this effort to develop a standard set of requirements for smart meter upgradeability on an exceptionally rapid schedule. The standard was completed in less than 90 days with the help of a team of meter manufacturers and electric utilities. Standard Meter Data Profiles (July 2010) (PAP 05) Different meter vendors report meter data in tables that are not uniform across all vendors. The reason for this is that ANSI C12.19, the relevant standard for this purpose, is a flexible revenue metering data structure. In effect, it allows such a wide range of options that a request for actionable information from a meter, such as usage in kilowatt hours, requires complex programming to secure this information. Translate ANSI C12.19 to the Common Semantic Model of CIM (Tasks and Completion tbd) (PAP 06) This translation will facilitate use of meter information to support back office functions and grid operations. Once the common data tables created under PAP 05 are completed, they can then be expressed in terms of IEC 61968 (CIM) as part of PAP 06, and appropriate tasks will be defined at that time. Some states have already mandated customer access to meter-based usage information. This action plan will lead to data standards to exchange fine-grained and timely information about energy usage. The first goal is agreement on a core information set to enable integration of usage information throughout facility decision processes. As part of this action plan, a limited set of requirements are driving a specification which is expected in February 2010. Subsequent work in the first half of 2010 drove a standardized information model for broader exchange of usage information. PAP10 is now in a monitoring and support mode to help facilitate the uptake of the standard by OASIS, IEC61970/61968, IEC61850, ANSI C12.19/22, PAP 17/ASHRAE SPC201, and ZigBee Smart Energy Profile (SEP) 2.0. Develop a summary of initial information needs for various means of customer access to metering and billing information. These initial requirements and use cases have been developed (October 2009). • Vet these requirements among standards organizations (including IEC, NEMA, OASIS, and ZigBee) and identify potential harmonization opportunities. UCAIug has committed to developing a statement of support for extending their process to include additional stakeholders. This work is in progress. • Carry out an initial effort to meet upcoming state public utility commission mandates (including California’s) to provide the customer electronic access to energy usage data (from both smart meters and legacy meters). This effort must plan for a transition to the broader energy usage effort, so applications designed to use the initial release will function properly in the presence of data from later, more extensive releases. The goal is to have useable definitions in place by February 2010 to meet Public Utilities Commissions’ (PUC) mandates. • Define a framework for sharing energy usage information with and within the premise with minimal changes to existing Smart Grid or legacy meters, during the first half of 2010. • Develop an information model that can be easily transformed and transported via standards and specifications including but not limited to those from IETF, W3C, OASIS, IEC61970/61968, IEC61850, ANSI C12.19/22, ASHRAE 135, and ZigBee Smart Energy Profile (SEP). • Implement a plan to expedite harmonized standards development and adoption within the associated standards bodies. While the value of DR is generally well understood, the interaction patterns, semantics, and information conveyed vary. Price (often with the time that the price is effective), grid integrity signals (e.g., event levels of low, medium, high), and possibly environmental signals (e.g., air quality) are components of DR communications. Defining consistent signal semantics for DR will make the information conveyed more consistent across Smart Grid domains. Lack of widely accepted signals across the entire DR signaling and validation chain hinders widespread deployment of these technologies.The focus of the DR standards effort is to integrate the standards work in OpenADR, OpenSG, IEC TC57, and NAESB efforts, Given the rapid deployment of smart meters, DR standards are widely acknowledged as a top priority, with a draft DR specification expected by January 2010. Develop Common Specification for Price and Product Definition (PAP 03) - Price is a number associated with product characteristics, including delivery schedule, quality (reliability, power quality, source, etc. ), and environmental and regulatory characteristics. Price also is a common abstraction for abundance, scarcity, and other market conditions. A common price model will define how to exchange data on energy characteristics, availability, and schedules to support efficient communication of information in any market. Develop Common Scheduling Communication for Energy Transactions (PAP 04) - NIST and collaborators are surveying existing calendaring specifications. They will develop a standard for how schedule and event information is passed between and within services. The output will be a micro-specification that can then be incorporated into price, demand-response, and other specifications. Easy integration of the specification will facilitate a common scheduling operation across different domains and diverse contracts. The Calendar Consortium will complete its current work on XML serialization of ICalendar into a Web-service component (WS-Calendar) by early 2010. ISO20022 will comment on and coordinate with the Calendar Consortium on schedule semantics across enterprise, energy, and financial information. Ongoing work in price and product definition standards development and in grid end node interactions (OASIS Energy Interoperability) will incorporate a schedule component pending completion of this work. PAPs supporting smart grid communications: . Guidelines for the Use of IP Protocol Suite in the Smart Grid (In December 2010, the Governing Board recommended "Internet Protocols for the Smart Grid" be included in the Catalog of Standards.) (PAP 01) - The analysis should identify which IP-based protocols are clearly applicable in specific application contexts and protocols for network control, management, and security, in addition to identifying any existing gaps. Review Smart Grid use cases and application domains and devise a taxonomy for applications with similar network requirements. Define a core suite of IP-based protocols required for Smart Grid networks. Identify additional protocols or protocol enhancements beyond the core suite required by specific classes of applications and develop guidelines for IP-based Smart Grid deployment. Identify key networking issues, including issues related to addressing, management, security, and those surrounding IPv4 vs. IPv6. Determine appropriate Smart Grid network architectures and technologies appropriate for basic transport and security requirements (e.g., shared IP networks, virtual private networks, MPLS switching, traffic engineering, and resource control mechanisms). Determine which transport layer security protocol(s) (e.g., TLS, DTLS, SCTP, and IPsec) are most appropriate for securing Smart Grid applications. Identify higher-layer security mechanisms (e.g., XML, S/MIME) to secure transactions. Identify new protocol or protocol enhancement standardization activities required to fully support Smart Grid in the future. Identify key issues to be addressed in wireless assessments and development for the Smart Grid. Identify requirements for use of wireless technologies for different Smart Grid applications. Identify approaches to define the strengths and weaknesses of candidate wireless technologies to assist Smart Grid design decisions. Analyze both intentional and unintentional interference issues and develop coexistence guidelines for deployment and operation. Harmonize Power Line Carrier Standards for Appliance Communications in the Home (PAP 15) - Several power line-based communications technologies are being considered for appliances, meters, and PEV communications in and across the customer premises. Relevant standards include ITU G.Hn (HomeGrid), IEEE P1901 (HomePlug™), and ANSI/CEA 709.2 (Lonworks™). However, these technologies are currently not interoperable and may not coexist successfully, and their operation in proximity may cause harmful mutual interference. Determine range of potential acceptable outcomes – coexistence or selection or convergence. Agree on an acceptable outcome for achieving coexistence among multiple PLC protocols. Develop Common Information Model (CIM) for Distribution Grid Management (Complete.) (PAP 08) - This PAP enables Advanced Distribution Automation (ADA) applications. New standards allow competitive procurement of advanced equipment that reduces capital costs. New life cycle maintenance and management functions are facilitated with advances in communications standards. Leveraging ADA compliments other systems of the Smart Grid such as DER, PEV, Smart Metering, and Renewables.Standards are urgently needed to enable the rapid integration of wind, solar, and other renewable resources, and to achieve greater reliability and immunity to grid instabilities resulting from wide-scale deployment. A CIM will also create a more reliable and efficient grid. This work is developing an approach for integrating application-level communications from three standards. IEC 61968, which is beginning to be used in the North American grid, and Multispeak, which is widely used by rural cooperative utilities, provide the structure and semantics for integrating a variety of back-office applications. In addition, IEC 61850 defines semantics for communications with substation equipment, including exchanging data on real-time operations as well as nonoperational data, such as for condition monitoring. Develop strategies to integrate and expand IEC 61970-301, IEC 61968, Multispeak, and IEC 61850 for Smart Grid applications. Create a scalable strategy to integrate other identified standards. Develop strategies to expand and integrate MultiSpeak, IEC 61850, IEC 61968, IEC 61970, IEEE PC37.237 (Time Tagging), IEEE PC37.239 (COMFEDE), and the future IEEE Common Settings File Format for Smart Grid Applications. Identify power equipment setting information that is required for performing an automatic verification of the power system configuration to prevent failures due to misconfigurations. This information shall include both settings in the devices as well as parameters of the power network that need to be available for verification. IEC 61850 Objects/DNP3 Mapping (Mapping documents, including guidelines for achieving interoperable integration of equipment using DNP3 with equipment using IEC 61850 Smart Grid standards will be completed in 2010.) (PAP 12) - DNP3 (the Distributed Network Protocol 3) is the de facto communication protocol used at the distribution and transmission level in the North American power grid. However, DNP3 is not fully capable of enabling all foreseen Smart Grid functions. Nevertheless, the Smart Grid must accommodate and build upon the legacy systems of today’s power grid including DNP3 and IEC 61850. Agree upon a consistent definition and/or algorithm to map a selected subset of IEC 61850 information objects to corresponding DNP3 data objects (May 2010). Provide a method to map between DNP3 data objects and IEC 61850 information objects. Because DNP3 uses less specific semantics than IEC 61850, this is only an approximate mapping. The DNP3 specification (Volume 8 clause 8.4 and its Appendix 1 clause 2) presents the approach recommended by the DNP3 Technical Committee, which uses XML to perform this mapping. This DNP mapping approach is referenced in Annex E of IEC 61400-25-4 (June 2010). Harmonization of IEEE C37.118 with IEC 61850 and Precision Time Synchronization Time synchronization (Mid-2010) (PAP13) - Synchrophasor measurements are key information needed by system operators to assess the status of the power grid. Using data from Phasor Measurement Units (PMUs), received by phasor data concentrators (PDCs), grid operators will be able to have better visibility of power grid operations and respond to grid disturbances earlier to prevent major blackouts. Two standards are related to communications of PMU and PDC data and information. IEEE C37.118 was published in 2005 for PMUs. IEC 61850 has been substantially developed for substations but is seen as a key standard for all field equipment operating under both real-time and non-real-time applications. Integrating IEEE C37.118 with IEC 61850 will help to remove overlaps between the standards, which may impede development of interoperable equipment and systems. Energy Storage Interconnection Guidelines (Mid-2010) (PAP 07) - Due to the initial limited applications of the use of power electronics for grid interconnection of ES and DER, there are few standards that exist to capture how it could or should be utilized as a grid-integrated operational asset on the legacy grid and Smart Grid. For example, no standards address grid-specific aspects of aggregating large or small mobile energy storage units, such as Plug-in Electric Vehicles (PEVs). Consistent, uniformly applied interconnection and information model standards, supported by implementation guidelines, are required for energy storage devices (ES), power electronics interconnection of distributed energy resources (DER), hybrid generation-storage systems (ES-DER), and plug-in electric vehicles (PEV) used as storage. Update or augment the IEEE 1547 distribution-level standards series, as appropriate, to accommodate the wide range of ES-DER system requirements, including new IEEE SCC21 projects to be initiated in Spring 2010. Augment the IEC 61850-7-420 object models for ES-DER based on the project descriptions for IEEE 1547 extensions (to be completed within a few months following the corresponding project descriptions). Initiate development of transmission-level standards for ES-DER. These should build on the FERC wind plant interconnect (LGIP) guidelines and European practice (e.g., e-on, ESB). Interoperability Standards to Support Plug-in Electric Vehicles (Year-End 2010) (PAP 11). - This action plan will define data standards to enable the charging of plug-in electric vehicles (PEVs). The specifications will cover charging at home or away from home using a special rate schedule, discharging of PEV energy storage for demand response purposes, and administration and monitoring. Identify regulatory impediments to achieving the goals defined in the PEV use cases. Review the current regulatory/use case conflicts to determine areas where changes are needed; advise regulatory bodies of the identified obstacles and develop options for solutions (to be completed by April 2010). The initial PAPs reflect just the beginning of an accelerated development and sustained standardization effort that will span a number of years. New PAPs will be developed over time as existing PAPs are completed to encompass the larger scope of standardization efforts that will be required as the nation pursues the vision of a fully interoperable Smart Grid. In collaboration with NIST, the SGIP also will be responsible for creating new PAPs to address gaps that are identified in the future. To facilitate this process, NIST has directed EnerNex, which is assisting NIST under an ARRA-funded contract, to develop a formalized template for categorizing, defining, and assigning new action plans. NIST PHASE 2 A public-prive partnership, the Smart Grid Interoperabilty Panel, was established in November 2009 to provide a more permanent organization structure to support the ongoing evolution of the framework. 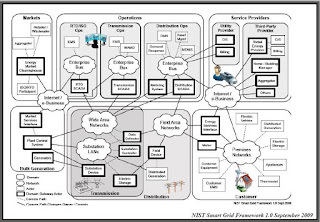 NIST’s contractor, Enernex, established the Smart Grid Interoperability Standards Panel (SGIP) to provide a more permanent process with stakeholder representation in order to support the ongoing evolution of the Smart Grid Interoperability Framework; to identify and address additional gaps, reflect changes in technology and requirements in the standards; and to provide ongoing coordination of SSO efforts to support timely availability of new or revised Smart Grid standards. Comprehensive information on the stakeholder make up of the SGIP, its meetings, and its findings is available at the NIST Smart Grid Collaboration Site. NIST PHASE 3 Develop Testing and Certification Framework - A robust framework for testing and certification of Smart Grid devices and systems must also be established to ensure interoperability and cyber security. Recognizing that some efforts exist today to test certain Smart Grid standards, and others are under way, NIST’s intention is to leverage existing programs wherever practical. Hence the first step in developing a Smart Grid Conformity Testing Framework is to perform an analysis of existing SG standards conformity testing programs. An in-depth study has been initiated to identify and describe existing conformity assessment programs for Smart Grid products and services based on standards and specifications identified in the NIST Framework and Roadmap Document. This survey will address, in particular, conformity assessment programs assuring interoperability, cyber security, and other relevant characteristics. NIST - Priority Action Plans - - Define the problem, establish the objectives, and, identify the likely standards bodies and users associations pertinent to the standards modifications, enhancements, and harmonization required. This link includes a calendar of PAP related events and meetings. Gridwise Architectural Council - Achieving interoperability can be supported by adhering to the principles outlined in the GWAC Decision-makers Checklist. Every day we keep feeding the media controlling filthy and unhealthy coal, gasoline, oil, and nuclear energy monopolies more money to fund their self perpetuating political machines. Somehow we need to break the vicious cycle they have us locked into.